It is often the case that these problems arise from what is called the ‘maloccusion’ of your bite. This means your bite is unbalanced and extra stress is put on the surrounding muscles of your mouth. It is really simple – all the patient has to do is bite down on an ultra-thin sensor. 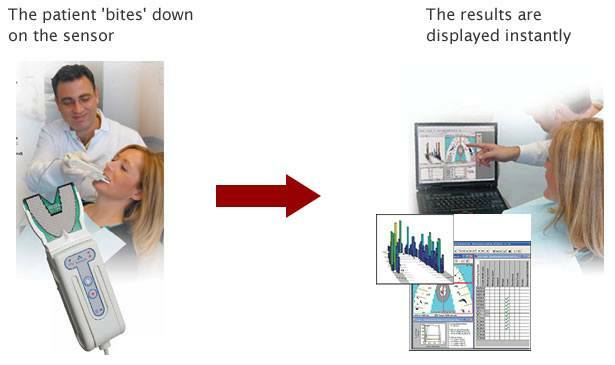 The software renders a dynamic analysis of your bite on the computer which enables us to identify contact points on individual teeth and the relationship to all other tooth contacts. A balance indicator guides adjustments using simple, understandable graphic displays. The results can be combined with periodontal charting, X-ray and tissue exam data to provide a complete assessment of your oral health. Speak to us about treating your headaches today.